July in Michigan is becoming synonymous with reports of anglers landing pacus—fish with human-like teeth used for eating nuts and seeds—in the southeastern part of the state. Last month, the Michigan Department of Natural Resources received three pacu reports—two from Lake St. Clair and one from the Port Huron area. Reeling in a pacus would be a surprise, perhaps even a shock to anyone fishing in Michigan. 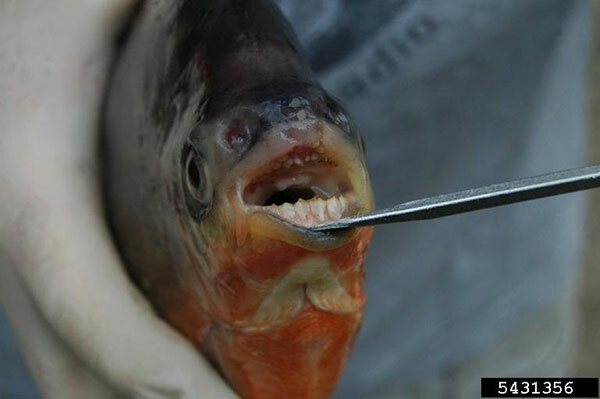 Though it looks somewhat like a native shad, the pacu’s squarish, blunt teeth clearly set it apart. It isn’t similar to any native, toothed fish, including trout, muskellunge or northern pike. The red-bellied pacu, Piaractus brachypomus, is a popular aquarium fish imported from South America. The U.S. leads the world in importing ornamental fish, supporting a worldwide aquarium industry that tops $1 billion annually. Though the pacu is a non-native fish, it is not considered invasive in Michigan. Invasive species are defined as those that are not native and also can cause harm to the environment, the economy or human health. A 2012 U.S. Fish and Wildlife Service assessment concluded the risk posed by pacus in the continental United States is uncertain due to a lack of research on the fish’s negative impacts. While the risk is uncertain for the U.S., pacus are not considered invasive in Michigan because they are tropical warm water fish that are not likely to survive the severe cold of Michigan winters. Pacus have been caught in lakes, ponds or creeks in at least 27 U.S. states. However, there is no evidence that breeding populations have been established in any of these locations. Current climate data indicate this tropical, freshwater fish is unlikely to survive Great Lakes winters, but climate change may increase the possibility. Finding pacus in the Great Lakes is evidence of a common dilemma; what to do when you can no longer keep an aquarium pet? Pacus are known to grow significantly, often beyond the capacity of their tanks. In the case of the pacu and other ornamental fish, there is another issue. Paige Filice of Michigan State University works with a new statewide campaign to Reduce Invasive Pet and PLant Escapes, or RIPPLE, offering solutions for aquarium and pond owners. Another option is to talk with a veterinarian or pet retailer about humane methods to dispose of the pet. More information about the RIPPLE campaign and managing aquarium pets and plants is available from the Michigan Invasive Species website. If you catch an unusual fish, keep it and preserve it on ice. If that is not possible, take photos of the fish. Do not return it to the water. Contact Seth Herbst, DNR aquatic invasive species biologist, at 517-284-5841 or herbsts@michigan.gov for assistance in identification.